Absolute power corrupts absolutely said politician, writer and historian John Dalberg-Acton... over 180 years ago. 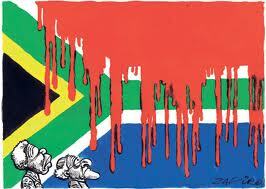 So why the 'F' do we [South Africa] have the largest police-state in the world? The United States of America has Federal States that act as minor sovereignties. They have independent laws, enforced by independent police forces, specific to their state. This fragmenting of 'enforcer' power stops corruption from spreading. Well it helps. And, most, Americans are proud of their police force - there is even friendly public sports competitions held between LAPD and NYPD. 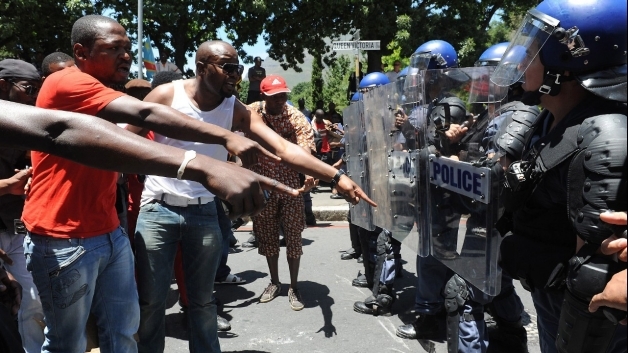 Yes there are factions of the police that are specific to South African Provinces. But when the JMPD and the SAPS are literally shooting at each other, we get annoyed at first then scared for innocent civilians. But hey lets buy new fast cars to catch reckless drivers instead of use the money for rehabilitation programmes. C'mon guys. Why are the poorest the most violent? Kind of a rhetorical question there; the less you have the more you want and the more desperate the measures to getting it. But this 'it' irritates me. Is 'it' power, which ultimately boils down to money? Is 'it' respect/recognition which again simmers down to money or is 'it' peace, which in this day and age is coupled with bias unilateral agreements and fabricated politicians? I guess the 'it' is subjective to region. Duh. But its no mere coincidence that the current countries in conflict has a combined GDP of Luxemborg. Me thinks the fighting needs to continue in order for the neo-aristrocrats to carry on... splurging. The image above validates my annoyance. Note and compare the countries that are/have been involved in conflicts against the countries that are in conflict. Hmm. Excuses like theology, geography or ethnicity are reputed by western media which in-turn fuels misconceptions and creates more tension. And which conflict has been the most profitable? The Ledgend of I Told You So Dammit! Welcome our latest 'Marxist' party. The leader is worth millions... totally relatable, down to earth guy. Here he is making friends... dam! When a government resorts to firing rubber bullets at a crowd protesting for better living conditions, then we may have a slight problem, but when that same government happens to be a former liberation party... hold on to yourselves. 2012 has seen a paradigm shift amongst South Africans, less talk more action! In the 1960's the people had enough. No longer content with being submissive and after long often pointless discussions with the opposition, enough was enough. MK, the "spear of our Nation" was formed as the military wing of the ANC utilising guerilla warfare tactics and sabotage all in the attempt to be heard! De ja vu much? These protests erupting in townships and impoverished settlements, have been around since early 2000's, however the severity has exponentially increased. In 2009, pre-Waka Waka, President Jacob Zuma made a public promise to South African's that the housing and service delivery plight would be resolved three months into his term. Failing to do so, majority of the 'have nots'were enraged-naturally. (No wonder DA support is growing in rural settlements. 200 protesters stoned policemen and their vehicles. Its like a rerun of '76 check it out: http://www.youtube.com/watch?v=YQsZH6BGJf0 (mind not the racial comments, weak minds). Bear in mind that South Africa did not have the 'assumed' civil war that opponents feared which is great, except for the pent up anger. Imagine being literally promised fundamental changes that would completely revolutionise ones lifestyle after endless violence, submissive legislations and forceful separation just to have a new slave-master at the helm. The new South Africa has been categorized as a Social Democracy-contemporary social democratic policies include support for welfare, Keynesian (public sector driven) macroeconomic policies and collective bargaining agreements to balance the power of capital and labour. There must be greater forces at work here. South Africa did not host the FIFA World Cup via draw or chance, surely the billions of Rands that multiple foreign direct investors pumped into the tournament would be seen in our social infrastructure. Quick flashback: Marshall Plan- Post WWII Berlin was divided into democratic west and communist east. Competing for support and driven by their ideals the Americans implemented a strategy of sorts to feed territories under Western democratic occupation with currency. Being the most powerful at the time, the dollar didn't just bring economic and political change but also social change. Western Berlin was quoted as being " a beacon of democracy" within the "Iron Curtain". Change, for better or for worse can be argued; the 26 reported conflicts that have occurred in Eastern Europe since 1989 to the present, was not stimulated by sharing of wealth, ethnic cohesion and internal forces. Bottom line is that the ANC is becoming synonymous with the formerly oppressive NP. History does repeat itself no-doubt but this time more of us are 'intellectuals'. Essentially, we can read, think, critique and act! Question is will we wait for the issues driving so many impoverished people to affect "the haves" before we act. A final thought: Former ANCYL president Julius Malema might be an egotistical, idealistic, crass individual but he stands for and "will always fight for", economic freedom. Hugo Chavez had the same stance and when he came to power he removed economic power from the concentrated elite and shared it with the population. Its no wonder he's the bad guy in western media. April fools, the lot of you! 30 April. Mark this day in your memories for it will be a milestone in South African history. Gauteng has implemented the e-toll system which will essentially charge commuter, you, for use of previously 'free' national roads. government want to introduce a tolling system to financially maintain the roads and ultimately stimulate economic growth. Yay. This will be the first time in our history that public roads will be privatised. I wonder what happened to the R35 billion of tax payers, you, money that was initially designated to the Ministry of Transportation 2011/12? Maybe they had to make repairs on their little red hotels, pay for a lavish centenary party... just saying. Did you know that you had to pay fuel levies, a portion of which gets allocated towards national road maintenance. Where did that money go?/ Who made the decision to change the allocation of funds and why by Zapiro's Hand weren't we informed? The fuel levy we pay now is round about R3 a liter and the 20c added in the new scam.. I mean Budget, will yield a gobsmacking R27 billion. Bear in mind the Teacher strike last year when thinking on these figures. Various alternative sources have reiterated that if petrol was raised between 16c and 36c a liter on the fuel price, then there would have been sufficient funds to cover the entire cost of the Gauteng Freeway Improvement project. Accountability would be ensured due to the practicality. An average sized car, would mean a cost of between 1c and and 4c a kilometer of travel-age, instead of the 30c our government wants to legislate, aka make into LAW. The biggest fail in this scheme is getting an Australian company to administer the project. Billions of our hard earned money is not just going to a foreign commercial organisation but.. Australians? Cue frown. No criteria for a selection process was ever made public, not even a public forum was ever held to deal with these issues, i'll tell you why! The reason my fellow internet users is as old as the Rockefeller Empire, money, control and power these are the three things that can put masses in chains. According to top economists the inflation that will occur on the e-tolls be so swift and cunning that people will be forced to catch public transport (control), the exponential increase in cost of living will have an obvious ripple effect on our lively hood, imagine taxi's costing R20 for a local trip, if you have a car imagine catching taxis (money)! Lower-income families will be financially stretched to a breaking points, resulting in obvious wage demands, more strikes and ultimately more DIVISION (power). Normally i wouldn't be to worried about African's, especially South African's constitution, something this ludicrous would never have passed... oh wait RICA. 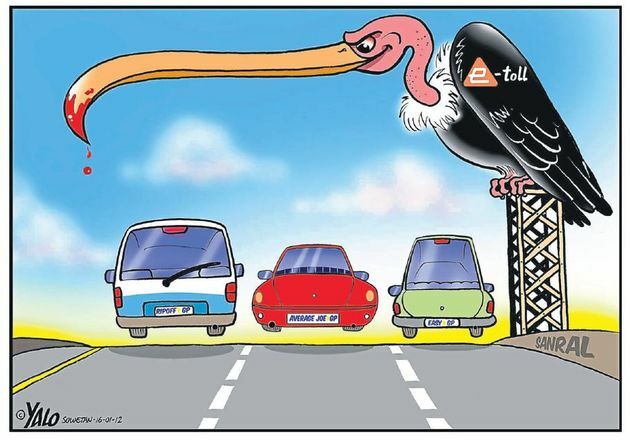 ok ok well at least millions of South Africans are still unaware about the Carbon Tax coming soon (on top of e-tolls). I'm Desmond Tutu angry!